In celebration of the beautiful weather, come in today for 20% off any outdoor/active items! The Playmobil Guessing Game has moved on to our Glenview store. 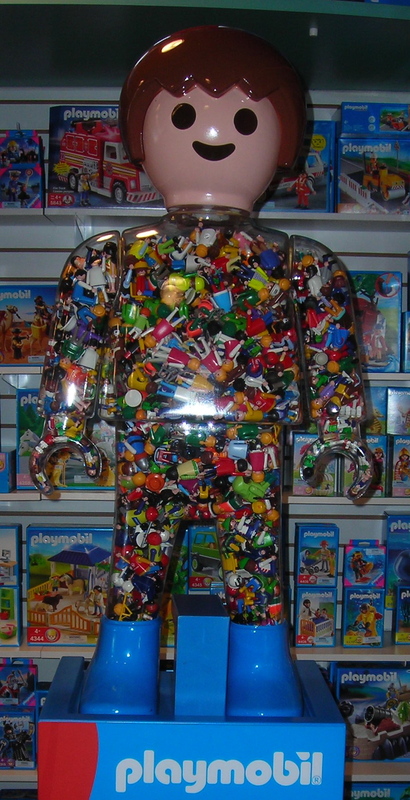 Stop in this week to estimate how many figures are inside of the large Playmobil boy. You could win a great Playmobil prize! Today is the last day to guess how many Playmobil characters are in the giant Playmobil figure. It’s moving on to Glenview next week. Come in to our Evanston store through March 27th to play the Playmobil “Guess How Many Game.” Estimate how many Playmobil figures are inside of the giant Playmobil boy. 1st and 2nd place winners will receive a Playmobil prize. We’ll keep you updated when the game moves to Glenview! New Folkmanis Puppets are here! We’re excited about the new Folkmanis puppets we just got in. Check out our video…these puppets speak for themselves! Posted in Uncategorized. Comments Off on New Folkmanis Puppets are here! Come in to either of our stores on Tuesday, March 2 for 20% any doll purchase (including Madame Alexanders, Corolle, and Gotz dolls). All you need to do is mention that you saw it on our blog! Posted in Uncategorized. Comments Off on 20% off Tuesday!